Since the dawn of the Age of Skyships, ruthless traders have competed for control of lucrative trade lanes. To prevent this conflict from turning bloody, the mighty Sky Guild was formed. But, it was only a matter of time before the Guild itself became the prize for the highly competitive Sky Traders! Now ruthless Sky Traders compete to become the Master of the Sky Guild! Cloud mining, negotiation, piracy, black market…which route will you pursue to become the new ruler of the skies? 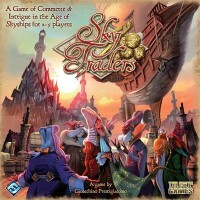 Load your skyship with valuable goods, evade ruthless pirates, and manipulate the commodity markets in Sky Traders, a board game of commerce and intrigue for two to five players. By dealing cargo for profit, cleverly playing the market, and maybe dabbling in some black market trading, you can build influence with the Sky Guild. If you become influential enough, you’ll become the next Master of the Sky Guild. Riches and victory will be yours! 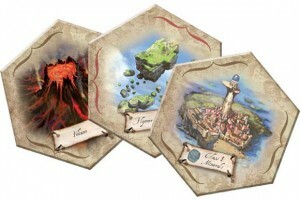 Each round of Sky Traders takes place in two main phases. In the first phase, players sail their ships and perform actions. The Guild Council takes place during the second phase of each round. To start the first phase, each player draws an Ill Wind card, which has a variety of effects that can help or hinder players. The Sky Patrol could attack you for carrying contraband, or the Wind Pirates might try to board your vessel in hopes of plundering valuable goods. If you’re lucky, you’ll stumble upon a treasure map that leads to riches. It’s all up to fate when you draw from the Ill Wind deck. 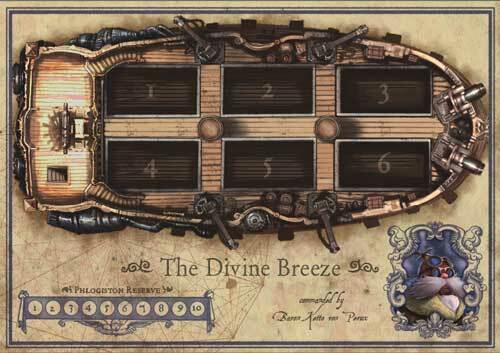 As captain of your own skyship, you’ll have to decide each turn how to best service your needs. Buying cargo at one port and delivering it to another city where the goods are highly desired is a great way to turn a profit. However, a captain also must consider hiring new crew, checking the ship’s phlogiston (fuel for skyships) levels, repairing damage sustained in pirate attacks, and other important tasks to keep the ship running at peak performance. When money is tight, haul toxic sludge or collect minerals from the countryside to make some quick money. Played this for the first time last night, and will surely play again. This quirky sort of steam-punkish fantasy romp is playful on its surface, but quite a challenge if you really want to win it. I say it that way because the game’s theme and setting make for a great adventure, win or lose. There is plenty of opportunity to try different strategies, to play aggressively or passively, to be clever and sly or out-and-out dastardly. And I really like the art style (although the characterizations are a bit over the edge). A “turn-order sidebar” would be very welcomed on the player boards – we were constantly passing the book around to remember all our options. The colors of some of the goods would be hard to discern in low light – so keep the dimmers on high for this one. Otherwise, the graphic design is excellent IMHO. Player interaction in this one depends very much on the player attitudes. I could see this played very passively or very aggressively, and I think a lot of that potential will become more obvious with experience. Looking forward to another session, and hope to play better! (I lost miserably the first time.) Recommended if you like lots of bits and lots of decisions. you can also play it like a strategy guy and own the sky. if you are searching for a 5 player game this one is pretty worth it. the parts are good material and you can paint the characters as they are big enaugh. the first time we playet it, the game lasted pretty long but the enxt ones were more fun and less time needing. Add a Review for "Sky Traders"